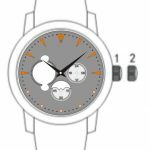 Time Setting: Pull out the crown and rotate the crown clockwise to set the time. 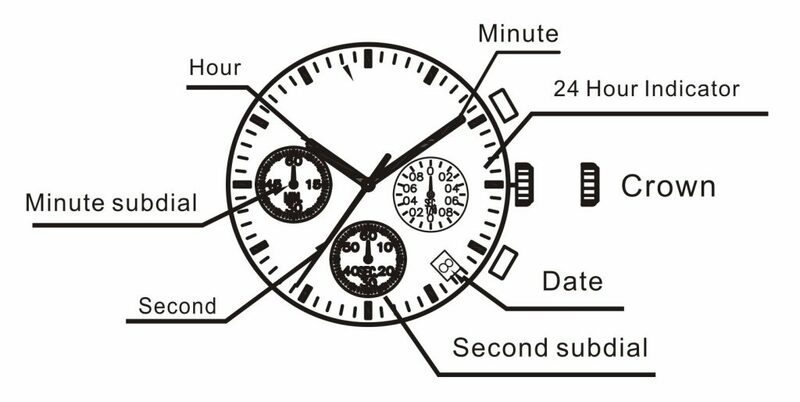 Date Setting: Pull out the crown halfway and rotate the crown to set the date, do not set the date between 9:00 PM and 1:00 AM otherwise the date setting may fail. Time Setting: Pull out the crown fully and rotate the crown clockwise to set the time. Pull out the crown fully to P2. Press A to turn 1/10 second hand to “0”. Press B to turn second subdial to “0”. Push the crown back when finished. 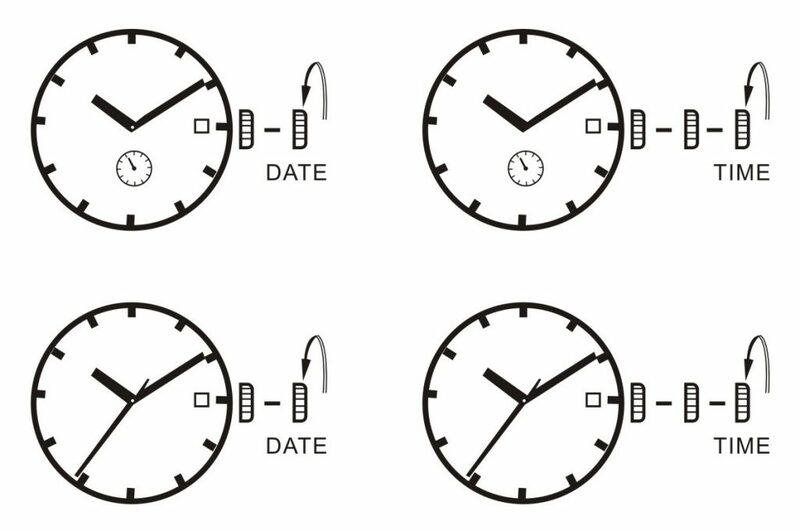 Date Setting: Pull out the crown halfway to P1 and rotate the crown to set the date, do not set the date between 9:00 PM and 1:00 AM otherwise the date setting may fail. 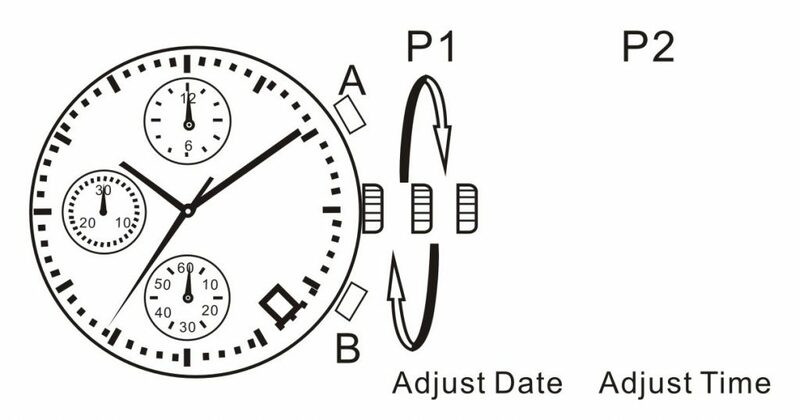 Time Setting: Pull out the crown fully to P2 and rotate the crown clockwise to set the time. General Timing Records: Press A to start, press A again to stop, press B to reset. Cumulative Timing Records: Press A to start, press A againt to suspend, press A once more to restart, repeat pressing A to suspend and restart as required, press B to reset. Split Timing Records: Press A to start, press B to record split time, press B again to release, press B once more to record another split time, repeat pressing B to record more split time as required, press A again to stop, press B to reset. 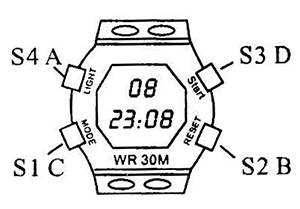 For Date Setting, Time Setting and Stopwatch instructions refer to Chronograph PE903. Analogue Time Setting: Pull out the crown and rotate the crown clockwise to set the time. Digital Time Setting: Under the normal status press C three Times into the time setting mode, push A and B to set the time according to certain order: second-minute-hour-date-month-day, press C again to exit when finished. Chime On Every Hour: Push B and C together to turn the time signal on/off. Alarm Setting: Under the normal status press C twice into the alarm setting mode, push A and B to set the alarm time according to certain order: hour-minute, press C again to exit when finished. When the alarm sounds push B to stop. Push A and B together to turn the alarm on/off. Stopwatch: Under the normal status press C once into the stopwatch mode, push A to start, push A again to stop, push B to reset, push C again to exit when finished. Hand Winding: Twist the crown clockwise at position 1 of the crown approximately 30 rotations to get full winding. 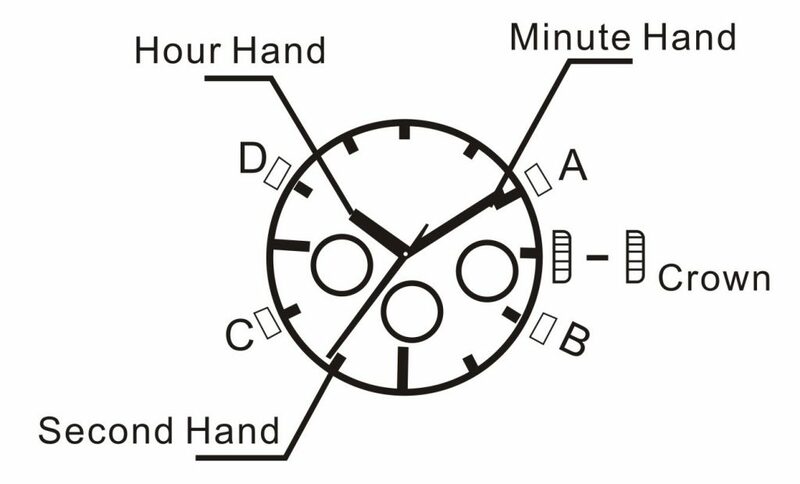 Time Setting: Pull out the crown to position 2, rotate crown to move the hands for setting time, push back the crown to position 1 when finished. Press C to exit Setting Mode. Press C to enter Stopwatch Mode. Press D again to stop. Press C to exit Stopwatch Mode. Press C to exit Alarm Mode. When the alarm sounds, press B to stop it. Press B and D together to turn the alarm on or off. 12/24 Time Format : It is 12-hour clock when 'A' or 'P' appears. 24-hour clock when digits from 13 to 24 appear.